The Westcliff has been Best of Food’s Best Bargain for a couple of years now, and co-owner Beverly Griswold says it’s because they’ve maintained that steady bargain for more than a decade. “We’ve been here for 12 years and our prices haven’t really changed that much,” she says. 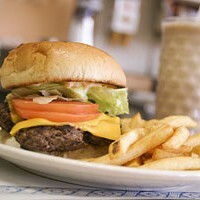 One of the Westcliff’s most popular selections is their cheeseburger and fries, which is only $3.99. Diners on a budget flock to the Westcliff to get the best bang for their buck.